Linsley learned how to do decoupage when she was in college, and soon began applying her designs on wooden boxes to make money. Since then, she's sold her work at Henri Bendel, Bergdorf Goodman, Tiffany and Cartier. In this lovely book, she explains decoupage, a""method of decorating an object with paper cutouts alone, usually a three-dimensional object,"" and accompanies her lessons with copious photographs depicting boxes, cabinets, plates, lamps, tables, benches, flower pots and other items she has decorated. A historical overview of decoupage is followed by a gallery of possible decoupage objects, from yard sale finds to auction winnings. Linsley then goes on to explore where ideas come from, how to approach design and how to display decoupage. The actual""how-to"" chapter comes late in the book, but it's well worth the wait: it's here that Linsley offers the nuts and bolts of her art. She reviews all the necessary materials, including various paints, varnishes and brushes, and offers tips on special effects. 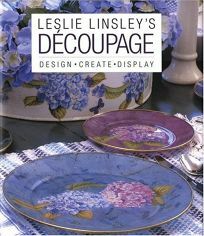 Linsley is able to show off her vast knowledge of decoupage while still maintaining a simple, understandable voice.